They’ve raised the bar with Strength To Survive, their fourth full-length album, an intoxicating mix of hot-rod reggae grooves and urgent, zeitgeist-capturing themes. The album, produced by John Alagia (Dave Matthews Band, John Mayer, O.A.R. ), is the band’s first for ATO Records, the label co-founded by Dave Matthews. Shortly after returning from Africa, Hemphill met Bobby Lee (bass) in the first grade in Virginia. The two instantly became best friends, finding common ground through their love of hip hop, rock and reggae which they performed together at their middle school talent shows. 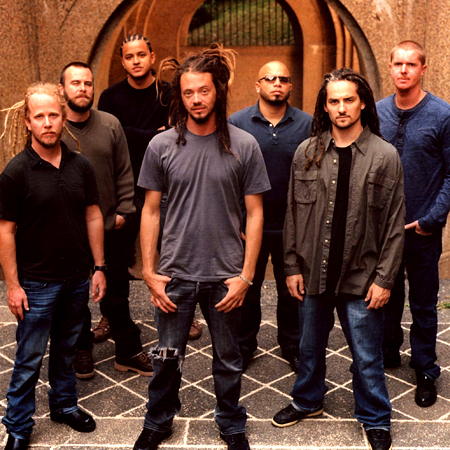 Throughout high school, they met Ryan Berty (drums), Kenneth Brownell (percussion) and Patrick O’Shea (keyboards) and together formed SOJA. The band gigged locally in the D.C. area while a couple of the guys finished school, all the while making plans to hit the road after graduation. They actually wound up owning the road. Over the course of the past few years, SOJA has sold more than 200,000 albums, headlined large theaters in more than 20 countries around the world, generated over 40 million YouTube views, amassed nearly 3 million Facebook fans, and attracted an almost Grateful Dead-like international fanbase that grows with each tour, with caravans of diehards following them from city to city. Most impressive of all, they’ve accomplished all this on their own. This 8-piece band has spent the past year and a half grinding it out from venue to venue, playing more than 360 dates, including headlining sold-out tours of North and South America, as well as opening for O.A.R. and sharing stages with everyone from Dave Matthews Band to Matisyahu.